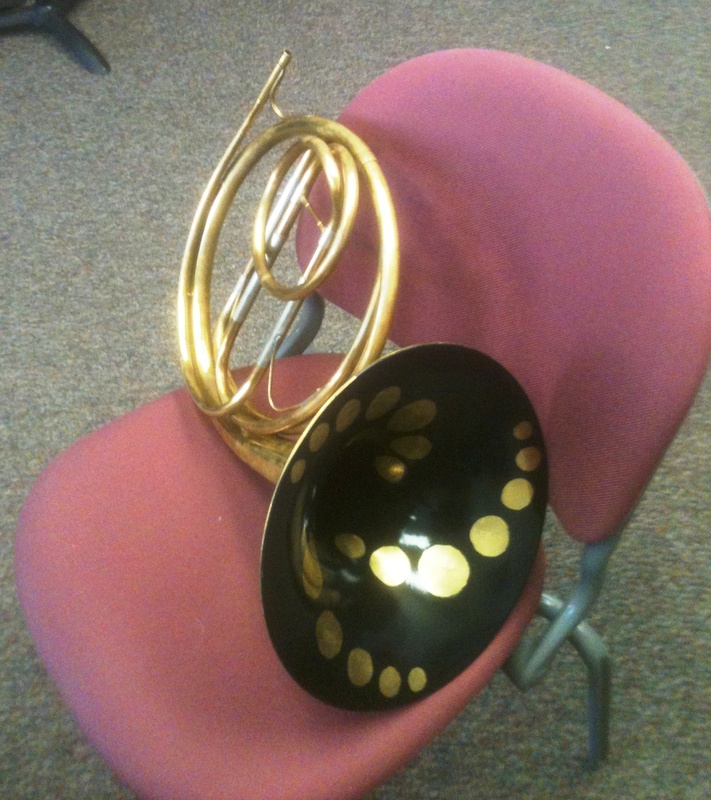 Near the end of last semester I purchased a new toy — a natural horn. It’s a great little instrument, and perfect for my needs, which mainly involve demonstrations for students and general noodling around. The horn was created by removing the valve section from an old York single F horn, and the work was beautifully done by Susan Anderson of Jackelope Brassworks in Eugene, OR. In addition to the “valvectomy,” the bell has been nicely painted (see image below). The horn also came with three crooks, F (shown here), E-flat, and a coupler to create a D crook. Although it isn’t historically accurate in terms of bell size or tapers, it is a lot of fun to play and durable enough to bring along for high school demonstrations. Back before the semester break I used it to demonstrate a portion of the Rondo from Mozart’s K. 495 concerto while on tour with our faculty brass trio. Most of the students had never seen a natural horn before, so it was quite fun explaining a bit about the history of the instrument and its technique. After the short demo we followed up with my arrangement of the same Rondo movement for brass trio (using modern instruments). I plan to do some more playing on this horn in the future, working especially out of John Ericson’s new E-book Natural Horn Playing Today. The instrument was very reasonably priced, and if you are in the market for an entry-level natural horn I encourage you to check out Jackelope Brassworks. I had a natural horn made by Leonard Brown that I used a lot while I was doing my BM and played it in both of my recitals… Looking to buy one of Lowell Greer’s horn after I move back to the US 🙂 They are very fun. Nice! 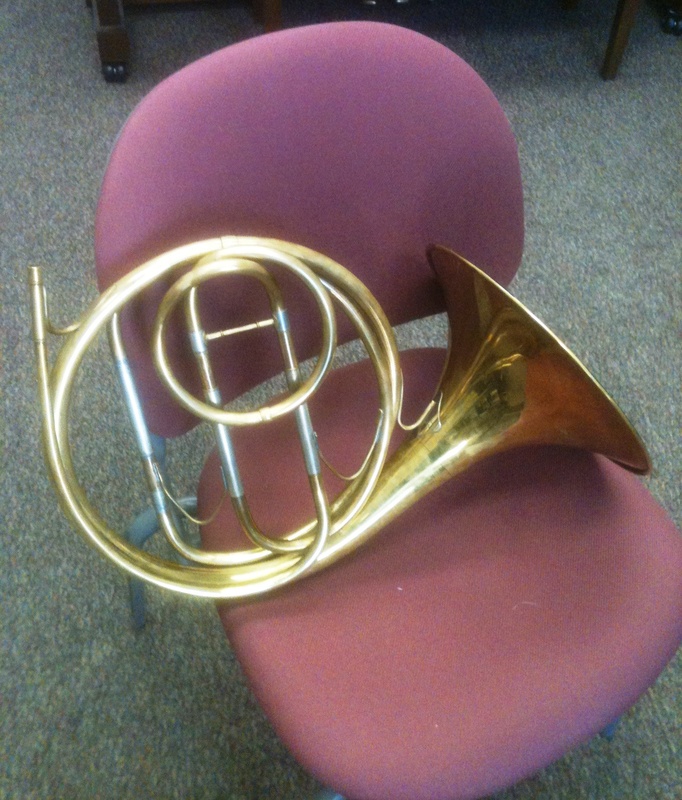 UW-Madison owned several Seraphinoff horns, and I was able to play on both the Baroque and Classical models. Looking forward to getting back into it again. Have you seen Paul Austin’s book? I bought it a few years ago as a way to teach myself. For the last year I’ve been taking lessons on natural horn and it has been really fun. I plan on getting a conversion horn or two for my students and teaching it to the advanced students. How do you like Dr Ericson’s book? It’s on my wish-list. Yes, his book is great! I used it in grad school to get going on the natural horn. Ericson’s book is also very good, and highly recommended.